The exhibition From Rubens to the Grand Tour focuses on two paintings by Peter Paul Rubens (1577-1640), the famous painter from the southern Netherlands and his expert knowledge of the antiques, and of the Romans in particular. The time period covered also includes the 18th and into the 19th centuries. Agrippina and Germanicus is on loan from the National Gallery of Art, Washington, and its “counterpart” Roman Imperial Couple is on loan from the Ackland ArtMuseum, The University of North Carolina at Chapel Hill. 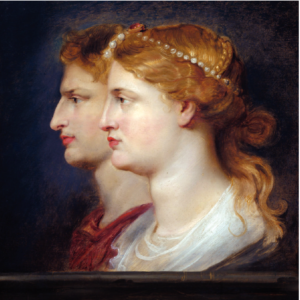 Rubens painted the two double-profile paintings upon his return to his native Antwerp in Flanders (present-day Belgium) after a long sojourn in Italy. Rubens had collected and brought back with him Roman coins, medals and carved cameos, which may have inspired the artist to paint the profile portraits. The concept of the exhibition is based on the Museum’s Curator Anke Van Wagenberg’s article, “A Matter of Mistaken Identity – In Search of a New Title for Rubens’s ‘Tiberius and Agrippina’,” in Artibus et Historiae (2005). The Museum will receive on loan several objects relating to numismatic collecting, including the 12 Roman coins dating to the first century A.D. from Augustus to Nero, from the American Numismatic Society in New York, while The Walters Art Museum, Baltimore, contributes – among others – collector coin boxes, of the kind that Rubens may have brought back with him. Fortuna Fine Art, New York, is loaning a sculptured portrait of The Empress Livia, Wife of Augustus. The National Gallery of Art Library is loaning rare 17-century coin collectors’ guidebooks as well as rare books on the Grand Tour. In Rubens’s day the travel to Italy to visit the Roman sites from Antiquity was not coined “Grand Tour” yet, however, the characteristics of such travel were not much different from the 18th and 19th centuries, when the term was in vogue for educational journey south of the Alps. Private collectors are loaning prints relating to travel, mostly objects that the typical “Grand Tourist” would have brought back from Italy, such as prints by Piranesi. A fascinating addition to the exhibition is the 19th century intaglio box of plaster gems, that were used as an intellectual after-dinner guessing game, to test one’s knowledge of the mythological image on each gem. Also on view will be a painting from a private collection by Theodoor van Thulden, a prominent pupil of Rubens’s as well as his two prints and made after Rubens’s designs that were recently added to the Museum’s collection.